The argument made by Alfred Loos in Ornament & Crime a century ago (1908) was essentially racist: a European aesthete equated ornamentation with primitive barbarism. Eighty-four years later, art anthropologist Ellen Dissanayake pointed out how the West’s value of simplicity was unique; that people all over the world use ornamentation as an expression of their humanity (Homo Aestheticus; 1992). In other words, the Western/European strain of thought has derided ornament for a long time, but this is a rejection of what the rest of the world appreciates. Ornament generates ordered information. It adds coherent information that is visual and thus immediately perceivable on a structure. Successful ornament does not stick something on top of form: instead it spontaneously creates smaller and smaller divisions out of the whole. Just like biological life, which is all about information: how to structure it, how to keep it together as the living body, and how to replicate it so that the genetic pattern is not lost forever. But without ornament, either there is no information, or the information is random, hence useless. The loss of ornament is the loss of vital architectural information. Ever since that fateful moment in history, there is little life in architecture. Unornamented forms and spaces are dead, sterile, and insipid, defining a sort of cosmic “cold death”: an empty universe where no life can exist. But for a century, this empty state has been the desired aim of architects: to remove information from the built environment. A century of thought by sophisticated individuals has resulted in Minimalism as an aesthetic trend, affecting the built environment, designed spaces, and designed objects. It is part of the story that includes not only Alfred Loos’ contribution, but also that of asceticism. Minimalism seems to be one of David Martin’s Christian ’time bombs’ that went off during the Industrial Revolution. Martin’s argument is that Christianity (which we can say began as a cult in Roman occupied Judea) spread throughout the Roman world and for the past two thousand years has survived through weekly repetition of its repertoire of ideas. These ideas slowly transformed what was once Roman society — shepherding civilisation through Rome’s collapse, then preserving knowledge until Europe could restore itself in subsequent centuries. Along the way, Christian ideas have gone off like time bombs, such as human equality, and the abolition of slavery. 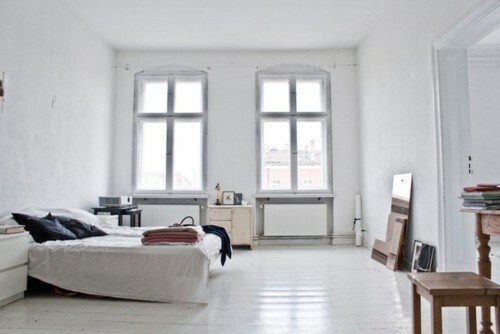 Minimalism would seem to be a contemporary expression of the asceticism taught to the West through the Christian tradition, and thus the contemporary minimalist practitioner might see themselves as practicing a form of spiritual sophistication, through what they consider to be “good taste”. There were so many things is that lost world. Our house overflowed with Dad’s old tapes, records and CDs, and Mum’s ornaments, and both of their books and magazines, and all of our musical impediments, and my and Leo’s many toys, which we never played with, but still regarded with totemic reverence. The flannel-wearing hoops-shooter is Jack Harper (Tom Cruise), a high tech drone repairman who lives in a futuristic compound (that more closely resembles a sterile medical lab that a cozy cottage) […] Despite the destruction of the Earth’s surface, Jack and Victoria’s home – in a tower high above – displays not a speck of dust or clutter, only gleaming chrome and glass. Even Victoria herself seems a piece of this decor, impeccably dressed in sculptural shift dresses … signifying Victoria as an integral element of this environment — serving the same semiotic function as her hyper-futuristic touchscreen computer, or the meals that appear as anonymous squares of surely nutrient-dense edibles served from individual vacuum-sealed pouches. These objects – of which she is one – loudly and obviously declare this as the future: a different, cold, and calculated environment in stark contrast with the relaxed authenticity of Jack’s cabin. The latter is a hideaway whose existence Jack keeps secret from Victoria. She is too much a part of one world to venture into the other one he has (re)-created. Oblivion in fact displays the temporality of contemporary expressions of Sophistication. On the one hand, we get the minamlised dust-free future. On the other, we get Jack’s cabin, his secret retro-world, filled with the archeology of Oblivion’s Earth. Here Jack wears a New York Yankees ball cap, checked shirt, and listens to vinyl records. Old, weather-warped books rest on rough-hewn shelves. The cabin world reflects our “Dream of the 1890s” and the other hipsterisms our present time – the Sophisticated Retronaut who has curated their life as if it were the decade between 1975-1985, with a vinyl record collection, gingam shirts, and the usual as displayed on Tumblr. Sophistication seems to lie on the spectrum between the Retro Past or the Austere Future, and the display of its corresponding taste. For either one curates objects of “warmth” or those that are “cold”, while “sentimental” responds to “calculating”. Concern for dress goes along with concern for one’s bearing and manner, and these reflect the self-control and civility that humans from the earliest times seem to have deliberately imposed on their ‘natural’ or animal inclinations and regarded as essential to harmonious social life. For the past two hundred years… the formality and artificiality that universally characterize civilized behaviour have been suspect. Wordsworth praised the beauty to be found in the natural rustic speech or ordinary people; since his time, poetry has moved further and further away from the characteristics that marked it as poetry for thousands of years [while] 20th Century Western artists have typically been concerned with making art more natural (using ordinary materials from daily life or depicting humble, trivial, or vulgar subjects) and showing that the natural, when regarded aesthetically, is really art. […] In this they both lead and follow, absorb and reflect postmodern Western society which is the apogee of the trend I have been describing where now the natural is elevated to the cultural, where nature and the natural viewed as rare and “special” are deliberately inserted into culture as something desired. I have pointed out that most cultures like shiny, new-looking, bright, and conspicuously artificial things. […] But we prefer the worn and the faded because they look natural and authentic. The Minimalised future is shiny and new and special, and thus in tune with our human natures. Yet it is also austere and cold, speaking to a sense of self-control and discipline, which is acquired … that is to say, civilized. Our flourishing Retro hipsterdom is the late 20th Century’s postmodern concern for authenticity spoken of by Dissanayake. But maybe it is also way for our culture to digest the records of the previous hundred years and decide what should be considered timeless, what should we formalize into the artificiality of culture which our human appetites desire.